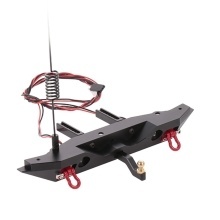 This metal rear bumper includes simulation antenna, trailer tail hook, 2LED light, just make you pay less but get more. It provides car body protection and extra bright lighting for mastering tough trails. Installation couldn&apos;t have been any easier, it suitable for TRX-4, Rc4wd, Axial, scx10. Good choice for you. Comes with simulation antenna, trailer tail hook, 2LED light, just make you pay less but get more. The simulation antenna makes your car look more cool.